Frais d'établissement et d'enregistrement: 60 $. 00 Plus taxe à payer à la station lors de l'enregistrement, non inclus dans le prix. Pour réserver le condo, nous prenons 400 $. 00 Le dépôt et le solde est dû 60 jours avant votre arrivée. We really liked the Kamaole Sands resort. Our unit was great. Very nice and clean. Good location as well. From the time we booked this unit right through to our 5-day stay, everything was perfect. Matt is great to deal with. Anytime we had a question, he responded immediately. The unit was perfect for our family of 4. The unit was so clean (washrooms, bedroom, kitchen); overall, it exceeded our expectations. The bed in the bedroom was very comfy as was the sofa bed (my husband raved about it). The kitchen was well-stocked too. While I’m giving this unit top ratings, I do want to say that the AC in the bedroom is very loud. We didn’t end up using it that much even though it was hot outside; took advantage of the ceiling fans instead. It was super-convenient to have a W/D in the unit too. The condo was also equipped with body boards, beach chairs, cooler, beach towels and beach toys. 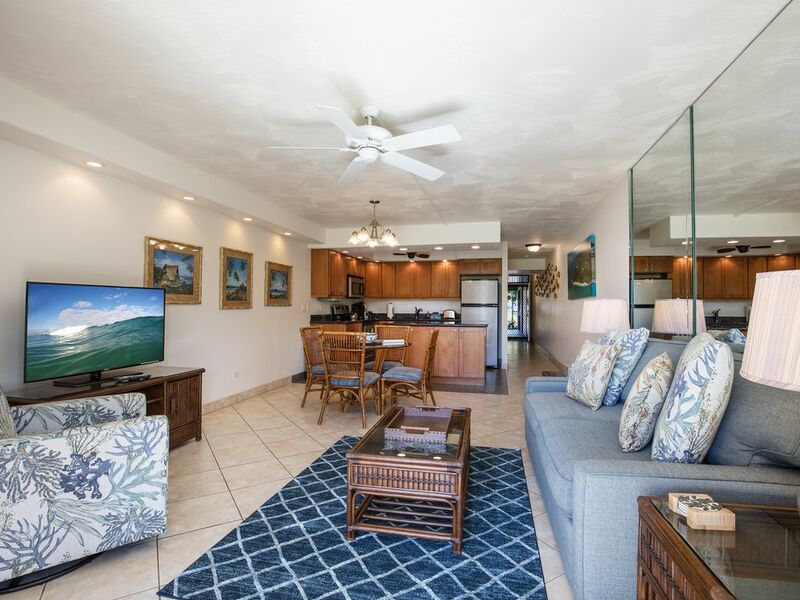 Loved the location of building 2 also; close to South Kihei Rd, close to the pool, and BBQ...with a peek-a-boo ocean view. Loved that this was a 1st floor unit; so convenient for kids to run back and forth from unit to pool! Our stay in 2-106 was amazing. Would be so happy to book this unit again if we’re lucky to come back to Maui soon. Thank you Matt/PMI for an enjoyable stay. We miss it already. We decided to rent an apartment because it give us the freedom to plan our time as we wanted. Location was great, very central and with easy access to the main roads. The apartment was very clean, the king bedroom very comfortable. The outside patio was lovely and every morning we had breakfast there. We had a very good time in Kihei.